The Miami Mozarteum is pleased to present some of the greatest musicians of our time, in performances with our orchestra and musicians. A truly legendary musician, Joseph Silverstein continues to have one of the most versatile and successful careers in music. As a violinist, he was a silver medalist in the 1959 Queen Elisabeth Competition in Belgium, and in the following year was awarded a Naumburg Award. 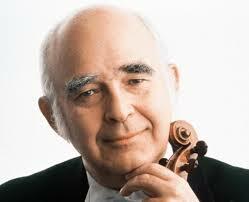 He has appeared as soloist with most of the major conductors and many of the major symphony orchestras worldwide. In addition, he was concertmaster of the Boston Symphony Orchestra from 1962 to 1984, and is still considered one of the finest concertmasters of all time. As a conductor, he was assistant conductor of the Boston Symphony from 1971 until 1984, music director of the Utah Symphony from 1983 to 1998, and acting music director of the Florida Philharmonic from 2001 to 2003. Mr. Silverstein has achieved great success as a chamber musician as well, his recordings garnering great critical accolades and multiple Grammy nominations. An active pedagogue, he is professor of violin at the Curtis Institute of Music, and has taught several generations of violinists. Pianist Gints Berzins began playing the piano at the age of four and entered the Jazeps Medins Music School in Riga, Latvia at the age of five. At eleven he won the first prize at the International Competition for Young Pianists held in Vilnius, Lithuania and the following year he won the first prize at the all-Latvia Competition of Young Pianists. Gints continued his studies at the Tchaikovsky Conservatory in Moscow and graduated in 1992. His solo appearances in the U.S. have included three recitals at Carnegie Hall in New York, as well as recitals in Chicago, Boston, Miami, Toronto (Canada) and others. He has had many solo appearances in Europe (Germany, Belgium, France, England, Russia, Lithuania and Estonia) and Australia. He has worked with a number of leading opera singers including Rene Pape, Dmitri Hvorostovsky, Anna Netrebko among many others. In 2010 Gints performed at the Mostly Mozart Festival with the festival orchestra and conductor Louis Langree. He has recorded three CDs presenting music of Chopin, Tchaikovsky and Mussorgsky, and is currently working on a six CD set of the Complete Piano Sonatas of Mozart.